Iceland, despite modern European levels of education, welfare and wealth, has almost no heavy industry. Their carbon rations will be up for grabs. Seeing the extra pollution coming, in 2001 Iceland got a 10% increase on the CO2 limits imposed by the Kyoto treaty. The problem is that the lack of heavy industry means a lack of the major power supply needed for such things. But Iceland has glacial rivers in vast areas unpopulated by humans; land for hydroelectric dams that can be seen as carbon-neutral. Alcoa proposed the Kárahnjúkar Hydropower Project. In the east of the country on one of the largest pristine wild landscapes left in Europe, they are to build a colossal project of dams, pipelines, and tunnels, diverting two of Icelandï’s largest glacial rivers and a dozen other clear-water rivers into a reservoir. Itï’s not just the submerged land that will be obliterated, but the land beyond the dam will be deprived of its water. 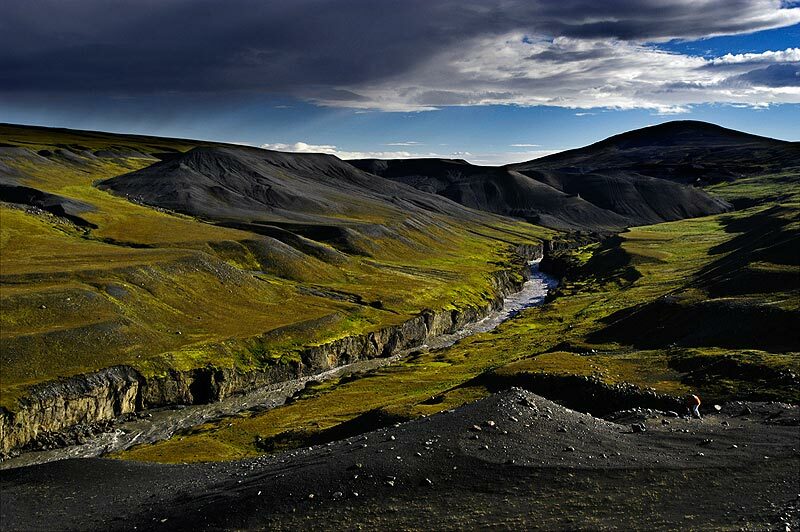 This is intact wilderness, the oldest surviving areas of Icelandï’s original vegetation. Around 380 square miles will be directly affected, with a far larger area secondarily impacted. And thatï’s before we mention the pollution the smelter will put into the air, the groundwater and pump out to sea. Silting of the dams will start as soon as the reservoir is filled. Collected there, when the water level seasonally falls the exposed silt will dry out. The strong winds in the area will carry substantial quantities of dust over great distances, damaging the delicate plant life and in turn the fauna that feed on it. The government has issued carefully worded statements saying that the risks are very small on the basis of known data. The amount of known data has been made deliberately small; a nearby volcano has had no hazard evaluation done on it, and the only good reason to be deduced is that the government donï’t want the wrong answer. Itï’s an opinion held by those who know most about the subject. Former director of the Nordic Volcanological Institute Guðmundur E Sigvaldason has criticised the governmentï’s wilful paucity of information, adding, ï’The observed heavy fracturing of the crust at the dam site combined with ongoing crustal deformation due to fluctuations in glacier loading is a serious matter of concern for the proposed projectï’. Such a scheme is so obviously crazy that it was rejected by the Iceland Planning Agency in August 2001, citing ï’substantial, irreversible negative environmental impactï’. Iceland has a population of under 300,000 – around the same as Bradford or Cardiff ï’ and with barely 60 MPs making up the parliament itï’s not difficult for vested interests to hold power and correspondingly corrupt decisions to be made. The appeal against the projectï’s rejection went to the Environment Minister, Siv Fridleifsdottir, who duly overturned it for no good reason in December 2001. The smelter is on. Construction has already started. Hillsides are already being blown up. When a minerals firm refers to a desire to ï’play a sustainable roleï’ ï’ as Alcoaï’s Hrönn Pétursdóttir does ï’ you know youï’re being greenwashed. The area of the Kárahnjúkar project is not a popular tourist destination. Indeed, there are no roads on much of it, and Alcoa have said the dam project could provide access roads for a possible national park (carefully mapped to avoid the area Alcoa want to use). Itï’s precisely this absence of humanity that gives the area its enormous ecological value. The tourism touted by Alcoa and the Icelandic government as mitigation is actually a furthering of the damage humans will inflict on the area. We have to learn to stop valuing the natural world in terms of its usefulness to humans. But at least national park status would protect land from future industrialisation, right? There is no reason to think so. The Kárahnjúkar project will submerge about a third of the Kringilsarrani environmentally protected area. Environment Minister Fridleifsdottir has justified it by explaining that ï’protectedï’ did not mean ï’for ever protectedï’. Alcoa and the Icelandic government claim the impact on ecosystems wonï’t be so great. When faced with the fact that theyï’re affecting reindeer calving grounds, they suggest that perhaps the reindeer will find somewhere else. Part of the solution theyï’re implementing is a cull of a third of the reindeer in order to offset the problems of reduced feeding areas. They see possible fossil-fuel rationing or taxing in the pipeline, so theyï’re just moving to where the electricity is cheaper. Itï’s nothing to do with environmental concerns at all. We need to be finding ways to scale back our consumption, not just move it around the world. The climate doesnï’t give a damn where we emit CO2 and other greenhouse gases, only that we do it at all. Even if we find power supplies that use less fossil fuel, we are still burning, polluting, transporting. Industrialisation itself needs to be scaled back. Italian construction company Impregilo won the contract to build the dams, primarily on the grounds that they made the cheapest offer, the only bidder to bid below the consultantï’s estimate. That fact in itself speaks volumes about any mitigation of environmental damage they might splash out on. Environmental consultant Dr Ragnhildur Sigurdarsdottir was commissioned to write a on the Thjorsa hydropower project. ï’I was asked to falsify my report to justify the larger-scale power plans Landsvirkjun wanted,’ she said. ‘When I refused, it was altered anyway.ï’ When she made this public, all other jobs she had lined up were cancelled. Landsvirkjunï’s managing director Fridrik Sophusson dismisses Sigurdarsdottirï’s allegations with the curiously uncontradictory word ï’unsubstantiatedï’. Even if the smelter were to be built, it could be powered by a smaller dam and geothermal energy. But Siggurdur Arnalds, the projectï’s PR man, says that making the dam any smaller would be ï’a waste of our national resourcesï’. The Icelandic government has underwritten the loans for the project, and so Barclays arranged the final $400m loan required by Landsvirkjun in July 2003. This happened despite the fact that a month earlier Barclays had signed up to ï’Equator Principlesï’ which were to guarantee ï’sound environmental management practices as a financing prerequisiteï’. In a globalised freemarket, the prices on which the whole project was calculated will change. The profits envisioned depend upon a consistently high price for aluminium. If it falls, itï’s the Icelandic taxpayer whoï’ll get the bill, effectively paying for the destruction of their own country. The smelter will create about 600 jobs. Not a lot and, in a country with only 3% unemployment, hardly something thatï’s desperately needed. It will, however, be a major exporter, it will generate some income for those with a stake. Many of those will be Alcoaï’s employees abroad. As with most foreign investment, it will act to siphon money away more than bring it in. Furthermore, the aluminium will be exported unworked; this means the real money will be made elsewhere. The use of it, the bit that adds value, will happen abroad. Iceland will be the equivalent of underpaid cocoa farmers, suppliers of essential raw material but the money is made by the rich-nation chocolate companies that turn it into finished products. The profits will go home to Alcoaï’s American boardroom. This is about the Icelandic governmentï’s image, the desire to be seen as a world player and using the hydroelectric potential as the springboard. The only real benefits for anyone will be in the form of corporate profits. Itï’s no more than a way for the rich to become richer at the expense of the environment. There is depopulation occurring in the eastern highlands, but a smelter is not going to change that. Icelandï’s low unemployment and enormous middle class (some 80% of the population) mean that such jobs are not going to appeal. The two smelters already working in Iceland are staffed using a lot of foreign labour. Likewise, the construction work on the project is being undertaken with the use of foreign workers. Campaigning group Saving Iceland has worked on many fronts, and this summer has been running SOS Iceland, a camp on land due to be drowned, where protests are planned and co-ordinated. Activists from all over Europe have been visiting, many passing on skills learned on previous protests elsewhere. On 19th July, the first political blocade in Icelandï’s history took place. Vehicles going to work at the dam were locked on to and work on the dam was halted. The police had to make up a word for ï’lock-onï’ on the spot! From the Narmada Dams in India to the proposed Ilisu Dam in Turkey, the story is one of big business and oppressive government. The struggle to save our planet, like the struggle against inhumanity, is global, so we have to be too. Weï’re here to prevent the Kárahnjúkar Dam project from destroying Western Europeï’s last great wilderness. The industrialisation of Icelandï’s natural resources will not only devastate vast landscapes of great natural beauty and scientific importance, but impair species such as reindeer, seals and fish, and the already endangered pink-footed goose and several other bird species. Through this mindless vandalism against nature, the Icelandic tourist industry will also be affected and the health and quality of life of the Icelandic people. If this dam goes ahead, it will pave the way for similar dams of glacial rivers all over the Icelandic highlands; Thjórsárver (protected by the international treaty of Ramsar), Langisjór (one of Europeï’s most beautiful lakes), the rivers in the Skagafjördur region and Skjálfandafljót. All just to generate energy for aluminium corporations. If this will be allowed to happen Iceland will face the same sad fate as other global communities, which have suffered under similar projects. Icelandic concern for the opinions of foreigners has a large part to play here. Aside from appeals to sense, to have concerns other than short term financial gains for the very rich, there is a way to appeal to those who do only care about money. Tourism is Icelandï’s second biggest industry, and itï’s largely based on that eco-angle; the geological weirdness, the unspoiltness. To build the dams is to tarnish that image and so have a detrimental effect on an industry far more important to Iceland than aluminium. If those further dams are stopped then thereï’s a broader global knock-on push against such schemes. Whereas if the dams go ahead, thereï’s gathering momentum to keep on with our overconsuming ecocidal ways, merely changing the source of our energy. The 10th World Aluminium Conference was held in Reykjavik in June. During a seminar with the oxymoronic title ‘An Approach to Sustainability For A Greenfield Aluminium Smelter’, activists showered bigwigs from the Kárahnjúkar project with green skyr (a sort of Icelandic runny yogurt) to symbolically throw their greenwash back at them. This marks a new turn in Icelandic politics, as direct action has been previously unknown. Icelandic and foreign activists opposed to the dam – if you want to donate money, these are the people to give it to. Incidentally, if youï’re wondering why youï’ve not heard about this before, it isnï’t only because of Icelandï’s remote location. There has been a peculiar silence from Greenpeace. Whilst WWF and Friends of the Earth have made representations, Greenpeace have said nothing. Clearly, Greenpeace cannot be unaware of the Kárahnjúkar project. Itï’s just that they are busy ï’offering to help the government promote nature tourism as an alternative to whalingï’. They have a pledge to sign where you say youï’ll visit Iceland if whaling stops. So they encourage the pollution from tourists flying to Iceland and sweep all other concerns, even one as mighty as Kárahnjúkar, under the carpet. A September 2003 visit to Iceland by the Greenpeace ship Rainbow Warrior met with American diplomats, but didnï’t mention the dam and smelter being built for an American company. They tell their members that the only ecological concern in Iceland is the slaughter of 500 whales. The colossal unnecessary destruction of unique habitat and monstrous pollution is ignored as inconvenient. Greenpeace members are being deliberately kept away from an important environmental issue that they have the power to affect. I suspect a majority of Greenpeace members ï’ especially those whoï’ve been convinced to sign the pledge – would be shocked to find this out, rightly feeling deceived and betrayed. Just like the way the National Trust reneged on its ï’for ever for everyoneï’ motto by doing swaps with the government for land on the Newbury Bypass, so with Greenpeaceï’s silence over the Icelandic dams we see those who act in our name prove themselves unworthy. If ever there was an example of why we shouldnï’t use the unwieldy corporate behemoth scale of working; why trusting others to do your political work for you is a last resort; why we shouldnï’t get dragged into compromise with the ecocidal forces that run the world; this surely is it.